Young people from Brynteg Primary and Holt Primary attended Park Hall Stadium to take part in our event. The morning session kicked off with Education Worker Chris Stokes and Steve Jenkins delivering a SRtRC Educational workshop to the pupils who took to opportunity to make some notes to add to their research. After the DVD it was time for the Role play press conference where the pupils took on the role of media journalists. 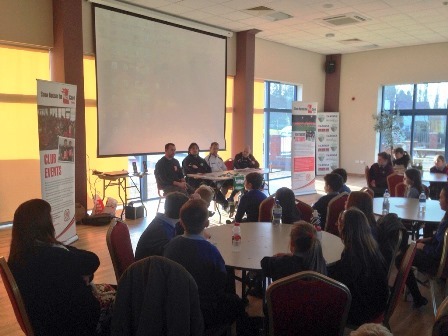 Using all the research they had done previously along with additional information from the educational workshop & DVD, the pupils were ready with their questions to ask the panel that included TNS FC manager Craig Harrison along with players Steven Evans and Scott Ruscoe. There were some challenging questions in the press conference and the best asked questions won a SRtRC goodie bag and a signed club shirt. We would like to thank the club for hosting the event, the school for attending the day and Craig, Steven and Scott for thier support in the Role play press conference.